It has been just over three years since I wrote the last news letter and a lot has transpired in the time that has elapsed. The various fixtures, glass shades, and chimneys that are displayed on the Argand, Sinumbra, and Solar Lighting and the Glassware and Miscellanea galleries testify to all that has been accomplished. It has been quite a struggle but very rewarding. This past year has been a good one. 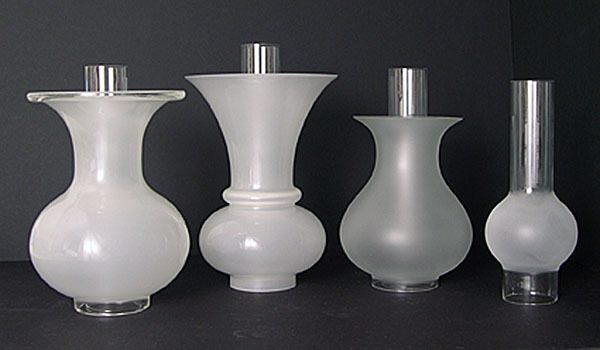 Sales of both lamps and glass have increased to a pleasing level. Here is a run-down of the past years accomplishments as well as plans for the coming year. The website has just been expanded and reorganized in an effort to make it more informative and easy to use. 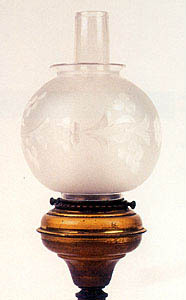 A new section that is devoted to educational and interesting material that relates to these superior oil lamps has been added and it is accessible in the Argand, Sinumbra, and Solar Lighting gallery  to visit this new section titled Related Topics click on the photograph at the bottom, right in the gallery. New material will be added to this section as it becomes available and of course, new products will be added as well, so please visit the site from time-to-time to see what is new. Four new Argand shades have been developed and they have proven to be quite popular. We have also developed new methods to frost shades so that the transition between frosted and non-frosted areas is not sharply defined but rather a hazy transition that is like that on period wheel-frosted shades. The solar 3-burner chandelier is very close to becoming a reality  all casting and spinning work has been done and all that is left to do is the machining of various parts, assembly, and finishing. Early chain has been reproduced and after a trial assembly I think that this will be a stunning chandelier. The solar harp lamps have been finished; the first two were sold to the National Park Service and sent to Wyoming for use in the general store at Fort Laramie. 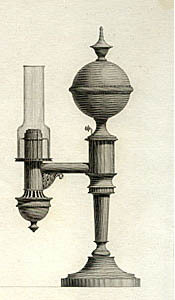 Work has just gotten underway on an Argand table lamp  a copy of the drawing of this lamp that appears in the 1820 Rees Cyclopaedia of Arts, Sciences, and Literature is posted on the Argand, Sinumbra, and Solar Lighting gallery. This is an early 1800s lamp and very appropriate for use in homes dating to the Federal period. 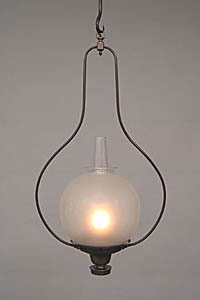 This lamp should be available by the spring of 2007. For more information, click on the photograph at the top of the gallery page. 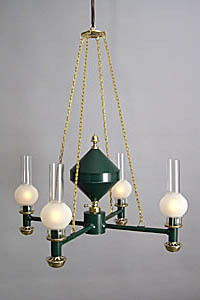 In early November a four-burner version of the Argand 3-burner chandelier was shipped to the Hardwick Historical Society in Hardwick, MA. In the 1800s it was customary for lamp manufacturers to sell a particular chandelier with 2, 3, 4 or more burners and in keeping with this practice we are doing the same. The New Year will also bring several new shades  a small spherical solar shade that will fit on the chimney retainer nut and also one or more different-sized sinumbra shades. The shades will be developed to not only meet the requests received from people who have lamps with no shades but also because plans are underway to have one or more sinumbra table lamps and chandeliers available later in the coming year. The photographs below have been copied from 19th Century Elegant Lighting by Gerald T. Gowitt. Several years ago I started doing the majority of the machining for the various lighting fixtures that are now available. This required purchasing a better lathe which I have since completely disassembled, modified, cleaned, and painted. 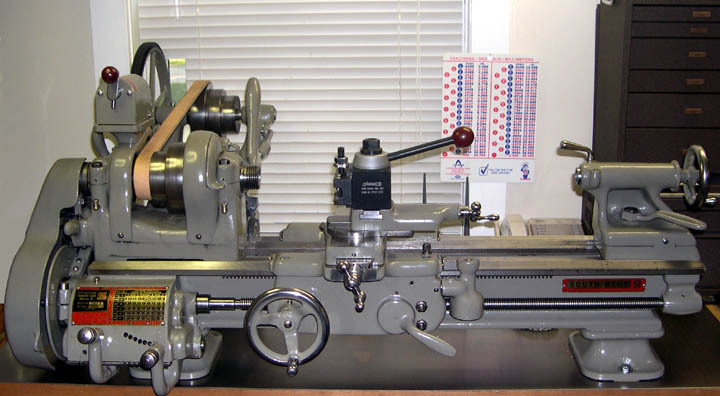 Quite an investment has been made in the tooling that was needed for both the lathe and milling machine. In-house machining has resulted in better use of funds available for the research and development of new lamps and has made it possible to increase the number of new reproductions that have been completed as well as those in the planning stages. to a Model A by adding a quick-change gearbox and a carriage with auto cross feed. Our shop facilities have been greatly expanded and updated and a room devoted solely to finishing has been added. A new and much larger spray booth has been purchased and installed and procedures involving the storage, handling, and disposal of finishing materials have been implemented in order to address sensitive environmental issues. This past year I gave presentations about Argand, sinumbra, and solar lighting at several historical societies. 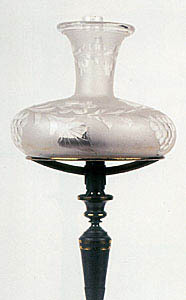 In order to demonstrate the inner workings of an Argand lamp, a lamp made predominantly from glass has been built (to see photographs, click on the top photograph of the Argand, Sinumbra, and Solar Lighting gallery page). It has been a very effective tool used to show the flow of fuel from the font to the wick and also how the spiral wick raising mechanism works. I am in the process of developing a more comprehensive presentation and am looking forward to doing more of this type of work. Not long ago I was very fortunate to find a copy of a rather rare booklet which is part of Websters Encyclopedia of Domestic Economy. The lengthy section that is titled Artificial Illumination is extremely interesting and informative. It has been scanned and digitally enhanced in Photoshop and is being made available in a spiral bound edition. Details are on the Argand, Sinumbra, and Solar Lighting gallery  click on the photo on the bottom, left. There is also some equally interesting information in the Cyclopaedia or Universal Dictionary of Arts, Sciences and Literature by Abraham Rees and this will also be made available in the near future. And finally, if in your travels you should be coming through Central New York State, you are more than welcome to visit the workshop. It is located in the town of Westmoreland less than one mile from Westmoreland Exit #32 on the New York State Thruway (Interstate 90) and just 10 miles west of Utica and 40 miles east of Syracuse. Be sure to call before stopping to make sure that I will be in. As always, it will be a pleasure to hear from you with your thoughts, comments, questions, and suggestions. And please, if you should find any information within the website that you believe to be inaccurate I would be most grateful if you would bring it to my attention.